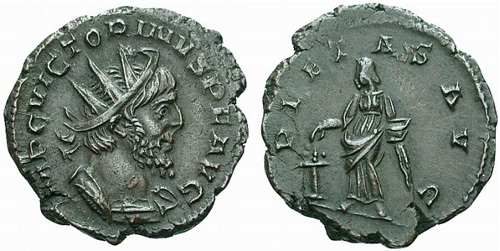 M. Piavvonius Victorinus, one of the Thirty Tyrants, was the third of the usurpers who in succession ruled Gaul during the reign of Gallienus. He was assassinated at Colonia Agrippina by one of his own officers in A.D. 268 after reigning somewhat more than a year. Obverse: IMP C VICTORINVS P F AVG, Radiate and cuirassed bust right. Obverse: IMP C PI VICTORINVS AVG, Radiate and cuirassed bust right. Obverse: IMP C VICTORINVS P F AVG, Radiate, draped, and cuirassed bust right. Reverse: PIETAS AVG, Pietas standing facing, head left, holding box of perfumes with left hand and, with right hand, sacrificing over altar to left. Reverse: PROVIDENTIA AVG, Providentia standing left and holding baton and cornucopiae; globe at feet. Obverse: IMP C PI VICTORINVS AVG, Radiate, draped, and cuirassed bust right. Reverse: SALVS AVG, Salus standing facing, head right, holding serpent with both hands. Reverse: SALVS AVG, Salus standing right, holding snake she feeds out of patera in her right hand. 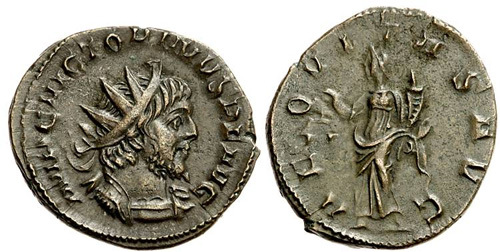 Obverse: VICTORINVS P F AVG, Radiate and cuirassed bust left, holding shield and spear. Reverse: SALVS AVG, Salus standing right, feeding serpent held in both arms.